A romantic comedy-drama, Salmon Fishing In The Yemen offers an unusual premise and an exotic setting, but still does not manage to elevate the central romance beyond the mundane. In London, Harriet Chetwode-Talbot (Emily Blunt) works for a consulting firm that manages the financial investments of the very wealthy Sheikh Muhammed (Amr Waked) of Yemen. Harriet reaches out to tweedy government fisheries scientist Dr. Fred Jones (Ewan McGregor) to assist on an unusual project: Muhammed is an avid fisherman and wants to establish a salmon spawning habitat in Yemen, to create employment and help build a local industry. Fred can think of dozens of reasons why this is bad idea that is unlikely to ever work. But the British government in the form of the Prime Minister's Press Secretary Patricia Maxwell (Kristin Scott Thomas) takes an interest in the project, and Fred is arm-twisted into helping to make it happen. Harriet's soldier boyfriend Robert (Tom Mison) is shipped off to the Afghanistan war, while Fred's long-term marriage to the icy cold Mary (Rachael Stirling) is disintegrating due to an utter absence of passion. Fred and Harriet start to work closely together, while Muhammed's outlook on life helps to awaken Fred's long-dormant spiritual side. With the construction of a salmon habitat in the middle of the Yemeni desert beginning to resemble an unlikely success, Fred and Harriet grow ever closer and a tentative romance blossoms. But there are many surprises to come, including sinister threats against Muhammed's entire project. 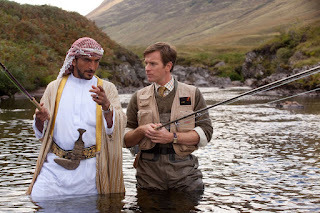 A British production directed by Lasse Hallström as an adaptation of the Paul Torday book, Salmon Fishing In The Yemen deserves admiration for creating a relatively original background context. A slick consultant and an introverted scientist combining forces to pursue a magnanimous sheikh's dream of creating a salmon run in the desert of a foreign land is admittedly unique. The script (by Simon Beaufoy) exploits the opportunities embedded in the idea to good comic effect, and brings in bumbling government workers and political interests tripping over each other in search of career preservation and positive political spin. Despite bouncing between London, the Sheikh's Scottish estate and the exotic Yemeni desert locations, Hallström keeps good control of the film's scope, and wraps up in 107 minutes. The result is a film where the backdrop premise is better than the primary romance, because unfortunately the relationship between Fred and Harriet is extraordinarily bland and fully contrived. The film takes no emotional risks by unceremoniously getting rid of boyfriend Robert and wife Mary early in the proceedings, clearing the decks for the stiff scientist and self-assured consultant to gradually spend more time with each other and fall in love. And this they do most predictably in the middle third, to the point where Hallström, in an effort to inject any sort of drama, has to manufacture tension related to whether or not farmed salmon will know enough about their species to swim upstream. The scientific parts of the film are glossed over. Once Fred expresses all his misgivings about the project, the film pushes ahead and appears to lose interest in how the engineering challenges are overcome. Plans materialize, heavy equipment shows up in the desert, and infrastructure just gets built at remarkable speed, with nary a comment or discussion about the ingenuity at play. Also poor is a vague and severely underdeveloped subplot related to Sheik Muhammed's enemies. This is a film where faceless and undefined bad guys show up to cause significant harm and havoc, but it is deemed completely unnecessary to explore the cause or origin of their discontent. Fortunately, the performances come to the rescue of the lame emotions. 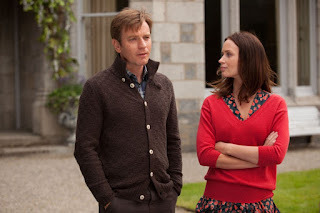 Ewan McGregor and Emily Blunt never set the screen on fire, but do develop a reasonably convincing affable relationship, and the film at least provides a serviceable scenario of co-workers growing increasingly fond of each other. Amr Waked is adequate as the distinguished Arabian sheikh with both material and spiritual wealth. Kristen Scott Thomas has the most fun and introduces the comic relief as the government secretary manufacturing good publicity at every opportunity, and improvising when every good opportunity turns into a disaster. Neither exquisitely seasoned nor stinking bad, Salmon Fishing In The Yemen lands somewhere between the big one and small fry.